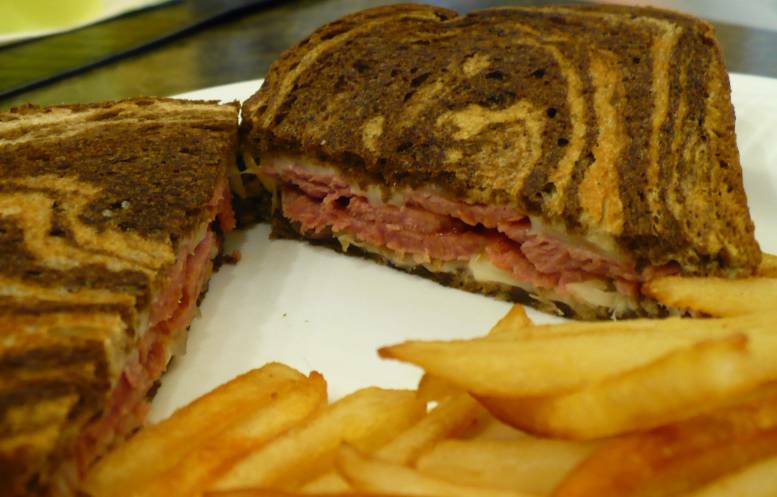 Just the thought alone makes your mouth water... corned beef, dark swirly rye bread, Swiss cheese, sauerkraut, with Russian dressing - grilled. Our national love affair with Corned Beef Sandwiches, also known as the Reuben, has been going on since the 1920s, though the exact origin is strongly disputed. Regardless of who owns the title of creator of the first Reuben, this sandwich has steadily gained in popularity over the last 90 years or so, especially during St. Patrick's Day festivities. It's nearly impossible to find a restaurant that doesn't serve this tasty sandwich and many variations exist as local bars put their own twist to this classic meal. Corned beef is very simple to prepare at home. Just remember to cook it low and slow and the result will be a fork-tender brisket that slices easily for sandwiches. Add additional water, if needed, to keep the beef covered. Remove meat from pot and allow to rest 10 minutes. Slice the meat against the grain and prepare sandwiches as below. Butter one side of four slices of bread, and place the slices buttered-side down on a large piece of wax paper on a flat surface. Top each with a slice of Swiss cheese, and then divide half of the corned beef among them. Using paper towels, squeeze out excess moisture from sauerkraut. Divide the sauerkraut among the sandwiches, and top each with one tablespoon of Russian dressing. Add another layer of corned beef and a second slice of Swiss cheese to each sandwich. Top with the remaining bread slices; butter the side facing out. Preheat a griddle or frying pan to medium heat. Cook the sandwiches on one side until the bread is golden brown. Use a spatula to carefully flip the sandwiches over and finish cooking on the second side. Cut the sandwiches in half before serving. Serve with Seven Day Slaw.